Berko's Matt Bateman netted his 37th goal of the season at Yaxley on Saturday. (File picture by Richard Solk). Playoff hopefuls Berkhamsted and Sutton Coldfield Town cancelled each other out on Saturday in a 0-0 draw at a muddy Broadwater. Berko boss Steve Bateman made one change from the team that drew last week at Coleshill, bringing in Harry Scott for his first start since joining from Thame United. The visitors Town went for an early goal, but Berko’s defence, with Ryan Kinnane at the helm, held firm for the opening onslaught. With few chances, the main talking point of the first-half was some alleged offsides at the canal end that were played on, benefitting the visitors. Berko’s Jonathan Lacey nearly stopped the stalemate just before the half-time whistle went. In the second-half Town’s Mitchell Piggon headed a good chance over the bar and the hosts’ Connor Toomey did well to clear off his own line with keeper Xavi Comas-Leon beaten by a shot. A Kinnane free-kick at the canal end was saved by stopper Lewis Gwilliams. Antonis Vasiliou came on for the Comrades and the 16-year-old had an immediate impact, starting with a mazy 50-yard crossfield run and shot that was saved again by Gwilliams. Lamar Simpson and Harry Dalton came on as a late double substitution with Bateman trying to break the deadlock. However, both defences held out in a game that will not live long in the memory, with few scoring chances. 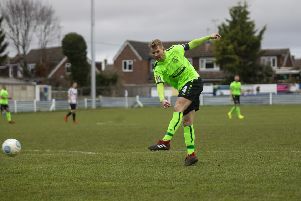 It was Berko’s fourth draw on the trot but leaves them just one place shy of a playoff spot in sixth place in the Evo Stik Southern League Division One Central table, two points behind five-placed Thame and two above Sutton Coldfield. Berko: Comas-Leon, Towell, Murphy, Spaul, Kinnane, Toomey, Scott (Vasiliou), Godfrey, Spaul, Matt Bateman, Lacey (Simpson), Summerfield (Dalton). Subs not used: Stevenson and Bircham. In other news, Elliott Godfrey, Berko’s experienced midfielder, announced his retirement at the end of Saturday’s game. He can look back on a great career starting at Watford and being capped by Canada at under-20s and under-23s level, followed by many years higher up the non-league pyramid. Max Farrelly returns from suspension for Berko at home to 12th-placed Aylesbury United this Saturday. When the two sides met at Chesham it was an entertaining match which ended 4-2 to The Comrades. However, as well as Godfrey retiring, Liam McCrohan has been ruled out for the season with a dislocated knee picked up in a midweek match for Hertford where he recently dual-registered, ironically to get match fitness. Jack Stevens and Marcus Campbell are the latest players to join Hertford. Both players began the season at Berko but have taken the Hertford route as that is allowed on the Isthmian side of the football pyramid. Berko, who were due to play last night (Tuesday), must wait to play their League Cup quarter-final, either at Royston Town or Lowestoft Town, as The FA have launched a probe. Royston thought they were through after winning a penalty shoot-out.